I get this question a lot from believers and nonbelievers alike. I've come to view death not as an enemy, but as the ultimate price we pay for love. To love is to sign up for inevitable loss. Love and loss are two sides of the same coin—we cannot have one without the other. While there are many forms of loss, death is certain and final in a way that ensures love is inescapably connected to loss. Death inquires of us, "Are you willing to love in the face of certain loss?" Instinctively, we try to negotiate for better terms and attempt to untether love from loss. These negotiations often consume our lives—we both deny death as well as attempt to love without the requisite willingness to experience loss. As a result, we tend to love with guarded hearts, connect superficially, and whistle past the graveyard as if no farewells are final. "Oh death, where is your victory? Oh death, where is your sting?" Inexplicably, these jubilant resurrection stories are also celebrations of love's demise. If a hero were to deal the fatal blow to death, their sword would necessarily cut through the very heart of love. Of course, most of us don't actually believe we won’t die, but many of us believe death is not final. We are invested in our resurrection stories, our reincarnation ideas, our theories of cosmic consciousness...anything but coming to terms with our mortality. Perhaps a partially-victorious death represents the best of both worlds; in this condition, love is preserved because physical death and loss remain inevitable, but they have less of a sting because we only “sorta die.” I appreciate why these ideas are appealing, and I suspect many of us entertain some version of "we only sorta die." However, the flipside of "sorta loss" appears to be a life where we only "sorta love." Maybe this is as good as it gets, and we will continue to produce stories of eternal life at the expense of this one life we know we have. As a believer, I celebrated the story of Christ's partial victory over death. I recognize now my belief in an actual resurrection dulled the pain of loss but also numbed the experience of love. Moments of human connection became insignificant against a backdrop of infinite moments. Love became cheap and empty when its value was diminished by an endless supply. 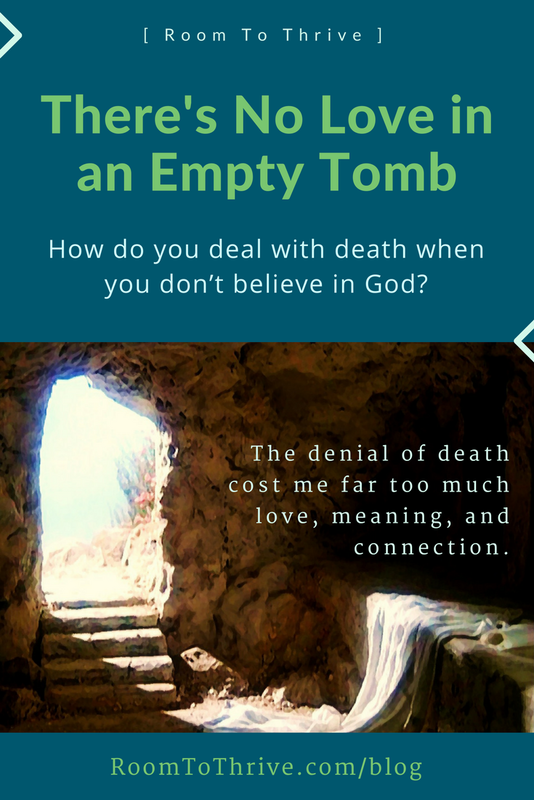 The empty tomb became a void—an aching shell of human experience where we refused to pay the price for love. I used to mourn the loss of immortality before I realized I never wanted eternal life. I wanted a few more days at the cabin with Grandma before she died. I wanted a few more hours to fish with my uncle before cancer. I wanted one more minute to say, “I love you” one last time. And I know, I desperately know, I’ll want a few more months, weeks, days, or seconds to be with my boys before I die. Through these tears, I see more clearly the price we pay for love and connection. Love is the most costly thing I’ll ever do and yet I’ll gladly pay the price because I’ve come to recognize it’s still a good deal. Avoiding loss and denying death has cost me far too much love, meaning, and connection. The promise of eternal life sucked the meaning out of this one life. Now, if someone were to offer me eternal life, I’d politely decline due to the hidden costs. I’m making peace with my mortality and finding immense meaning in my humanity. After all, creating meaning is what we humans do so well. Now, when death poses the question, "Are you willing to love in the face of certain loss?" I notice my impulse to avoid experiencing loss and I find deep and meaningful connection when I have the courage to say, "yes."